A week or so back, I put up a post titled “The Wisdom of the Crowd” that was in part about my Twitter poll, which suggested that 3 out of 4 lacrosse fans expected to see an increase in scoring because of the shot clock. Well, the post has had a chance to marinate out in the ether, and I’ve seen several follow on discussions happening around the web. One of the things was a potential confusion I’d probably created through a general lack of explanation. When I say 80 seconds of possession, that includes however many shots occured on the possession. So in theory, even if the first shot came 5 seconds into a possession, if the team retained control of the ball and scored after 81 seconds of total possession, it would count towards their percentage below. 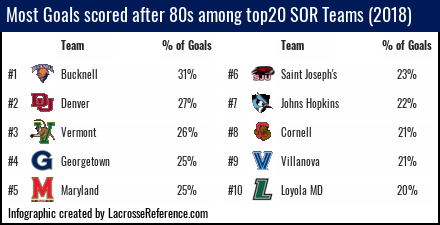 Another topic of discussion was related to how, of the top 20 offenses, the ones that scored the highest percentage of their goals after 80 seconds would be teams to watch. The thought was that if their success was based on patience, then rules that penalized patience should hurt them especially. Someone out on the Cornell message boards posited a follow up (I’m paraphrasing): Showing it for the top 20 offenses is cool, but what about the best overall teams (the ones that made the NCAA tournament)? A few things jump out at me. 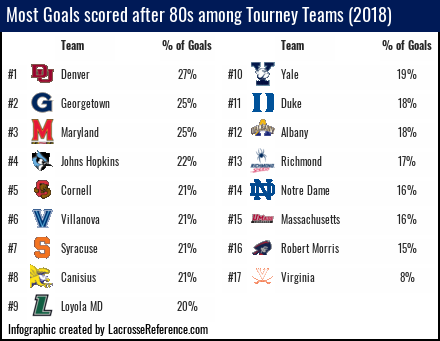 First of all, just comparing the top 10 offenses that made the tournament (in terms of percentage of goals after 80s), it’s a slightly faster group overall. 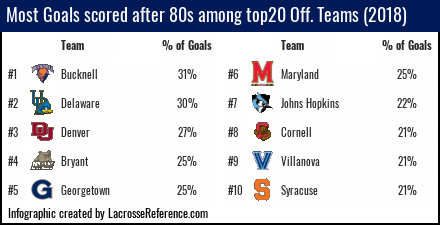 Syracuse had the 10th most goals after 80s among the top 20 offenses last year; among tournament teams, they were 7th. Our web readers asked for NCAA tournament teams, so we obliged, but to be honest, that’s probably not the best way to split it up. Bucknell, for example, is included in our top 20 offenses, but not in our tournament teams list even though they were unequivocally better than, say Canisius (no offense Griffs). So what if we used our Strength-of-Record metric to identify the true top teams last year? Of our top 20 teams last year, these are the 10 that had the highest percentage of their goals scored after 80 total seconds of possession. I’m not sure that there is much to say here other than, if you want to see how top teams end up being affected, these are the 10 that might be affected the most.